The next lens comparison is ready, because I have nothing else better to offer at the moment. This time we'll check out the Sony CZ 16-35mm F/2.8 at 20mm, and the Sony 20mm F/2.8. I've had several people wonder (out loud) about how the new Zeiss lenses rate among the primes offered by Sony, and some of the older Minolta designs. I'm too lazy to do a complete review, so this is all you're going to get for the time being. It's actually pretty interesting, and I include center and corner crops, distortion, and ghosting, so check it out here. The new lens comparisons are being put on a new page, and the link will be located at the very bottom of the Nav bar to the left. I'm doing this to save space on the homepage, and avoid longer load times. The much ballyhooed Sony DT 30mm F/2.8 macro lens is now available for purchase in the US. I ordered mine, and as soon as I get it, I'll whip up a review. The first installment of my new random lens comparisons is below. I like doing this just for kicks, as it doesn't take up too much time. I've been playing with the Tamron 17-50mm F/2.8 XR Di II for the last week or two, (thanks to Richard in CA), and noticed it was pretty sharp across the entire frame when stopped down at 50mm, so I decided to do some quick comparisons with the Sony 50mm F/1.4 lens using apertures of F/2.8-8.0. Now then, when you look at the comparison crops below, (now located here at the bottom of the page), you may just notice the Sony is sharper than the Tamron, so big deal. If this is your reaction, then you're missing something important. If you really look at the F/8 crops, you'll see they're almost the same in the centers, with the Sony just a bit sharper when comparing the corners. If you're still saying to yourself "big deal," then consider this; the Sony is a full frame compatible lens, (meant for 36x24mm sensor or film) consequently, when used on an half size sensor APS-C camera, you're only using the middle portion of the lens, which is the best part. The Sony is also a fast prime lens, meaning it is designed around that specific focal length only, and to give fairly good results at very large apertures, like F/1.4, and really good results stopped down to F/5.6-8. There are few sacrifices involved since there is no zoom capability. The Tamron lens is designed for APS-C cameras, meaning the entire imaging circle is used, which includes normal contrast problems around the image periphery. The designers must also contend with making a zoom lens perform good at all focal lengths, and make appropriate compromises. The crops below are part of an image that would print out about 45" (1.14m) wide as you see it on your computer screen, and the actual crops come from about 200-300 pixels from the corner! I'd say off the cuff the Tamron would make a good landscape lens at that focal length, but I think I'll hold my thoughts on everything else until I'm completely done with the review. The Tamron 17-50mm F/2.8 XR Di II review will probably be ready sometime around the first week of November. I've updated the "coming soon" list to include the newest lens arrivals for reviewing. The list probably won't be done in the exact order you see, but hopefully it'll be close. I'm not planning on doing a "normal" review of the Sony 16mm F/2.8 fish-eye, most people are not going to examine the pictures from this lens with technical scrutiny, it's more of a "fun" type lens. I'll use the A900 only, and post some shots and information I think are useful. Attention any PDF experts out there; what's the cheapest software (legal) that I can buy to manipulate PDFs sent by other readers. I usually need to rotate and change file sizes etc. I have MS Office Word 2007 so I can convert stuff I have, but I can't change anything sent from others. I know there's cheap software to convert PDFs back to other types of files, like JPEG etc, but I'm looking for legit Adobe software if possible, costing less than $100. Anybody have any ideas? Several readers have asked about how the older Minolta and Sony prime lenses compare to the new Carl Zeiss Sony zoom lenses, like the 16-35mm, and 24-70mm when used at the same focal length and aperture. Although I'm not really up to reviewing every possible combination, I'd like to post a few quick comparison shots (sharpness crops, light fall-off, distortion, etc) a couple of times a week, just for fun. 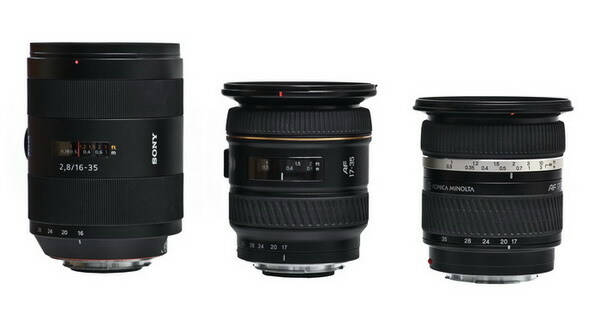 Maybe start off with the Minolta AF 24mm F/2.8, Sony 28mm F/2.8, Sony 35mm F/1.4, and Sony 50mm F/1.4. I'm wondering myself how things will look. Is it October already? I'm behind a little, and got carried away as usual and spent way too much time on the Super-wide zoom comparison page, which compares the following lenses; Sony CZ 16-35mm, Minolta AF 17-35mm F/3.5 G, and the Konica Minolta AF 17-35mm F/2.8-4. I used the A900 full frame camera exclusively, since these lenses are more appropriate for that format. If you're in the market for a super-wide zoom for your Sony camera, you'll definitely want to check out the review, because it may save you a boat-load of money! Note; lovers of Minolta G glass may not want to view this page. Since the Sony 16-35mm is slightly wider than the other two lenses, it was at a disadvantage when comparing the center and corner crops. I used the Sony at 16mm as a normal person would, instead of trying to turn it to the exact same focal length (17mm) to perfectly match the KM and Minolta G coverage, that's not practical, or useful when comparing these lenses in this review in my opinion. This disadvantage doesn't hurt the Sony at all. I've updated the reviews of each lens to reflect the differences that were found by direct comparison.